For most people, if a tree falls down in their yard, they call someone to cut it up and haul it away. Not Tom Throop. He'll turn it into a work of art. That actually happened to him in New Canaan. As a wood furniture maker, Throop had a client approach him about a walnut tree that fell in his yard. Throop had the tree cut up, and after the wood dries he plans to turn it into furniture for the man. "There's that nice connection that people won't get otherwise from furniture," he said. "It's nice for the client to say that this came from that tree." 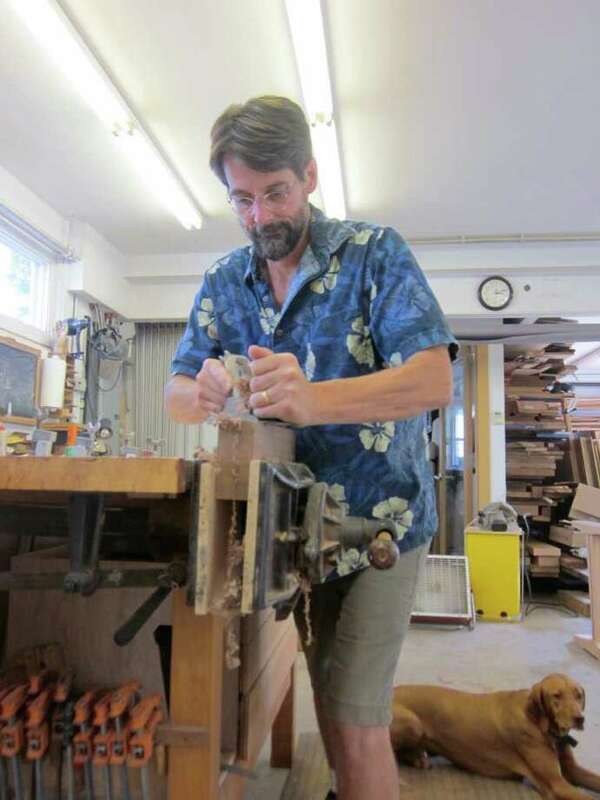 It's Throop's ability to see art in a piece of wood that has kept him in business as a custom furniture designer in the New Canaan area for the last 10 years. As the owner of Black Creek Designs on Grove Street, he's been able to carve himself a niche that has allowed him not only to follow his inspiration as an artist, but as an entrepreneur who chooses his own work schedule. "I'm fortunate enough to be making a living doing what I am passionate about," he said. "Every day is different, but the most satisfying thing for me is to conceive a piece that my clients can respond to." Born in New Canaan in 1964, Throop has returned to roots after traveling around to find himself as an artist. Taking his inspiration as a woodworker from his boat builder uncle, he said he always knew he would wind up doing something artistic. But upon graduation from New Canaan High School in 1982, he attended Connecticut College and pursued a degree in economics. "It was too theoretical, and I am a like-to-see-it-get-done kind of guy," he said. "It just wasn't my thing." He spent the next four years doing house restoration with his brother, but the bad economy of the late 1980s brought business down. It was then that he realized that woodworking was his thing, and he left for England. He enrolled in a two-year apprenticeship program with John Makepeace, a famous furniture maker who took on only 11 students per year. The intense program taught him all he needed to know to become a self-sustaining furniture maker, skills ranging from business plans to marketing, but also creative skills such as turning, working with veneer and making furniture by hand. "Kids today don't get taught the basics of how to do things by hand," he said. "They just know how to push things through by hand." When he graduated, he had a portfolio of work to show off and was able to generate enough commissioned work to stay in England for six months before coming back to the United States in 1993. He spent some time in upstate New York tutoring a student in exchange for studio space before moving to East Hartford, and then South Norwalk in 1994 where he spent three years working in a studio there. In 2007, his current space in his hometown became available and he jumped on the opportunity. Some of his best works include dining tables, beds, desks, and bookcases that have become a pieces of art that stand in a client's house. He has even built custom music stands. He works with all sorts of woods that he gets from as far away as Oregon. He has a unique ability to know the characteristics of different species of trees -- and he has to, since certain woods can expand and contract up to a quarter-inch a year depending on the humidity and other factors. If he doesn't build something with that in mind, the piece could get ruined. "Every tree has different traits, and you have to be in sympathy with that," You can't work against that." Throop lives in Rowayton with his wife Kelley and their dog Radley. When he's not working, he likes to go hiking, kayaking or gardening. Contact Black Creek Designs by calling 203-966-5798, or check out the website at www.blackcreekdesigns.com.